Never pay for mobile charging or lighting again! The d.light S100 solar lantern is our most affordable mobile-charging lantern, with double the savings. The unique dual-function lens of the S100 spreads ambient lighting throughout the room, while having a bright spotlight in the center to function as a task light for studying and working. 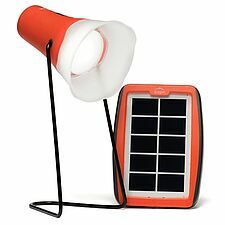 The bundled solar panel allows direct charging of mobile phones during the day, ensuring you are never out of charge again.